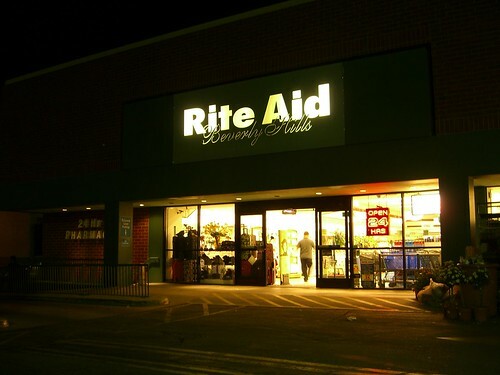 Rite Aid Beverly Hills, at night. Yes, that’s right (or should I say “Rite”). Not only is there a Rite Aid in Beverly Hills, they actually call it “Rite Aid Beverly Hills” with “Beverly Hills” written in script on the sign as if it were a Bentley dealer or Cartier. Upon going into the store, it was mostly good old Rite Aid- sunscreen, medicine and snack food as far as the eye can see. There was an ice cream parlor inside too, but I have seen those in other Rite Aid locations. It’s not like they were selling caviar and pate flavored soft serve or anything either, it was just regular ice cream. This picture depicts a display window on the back of a trashy lingerie shop on La Cienega Blvd. in West Hollywood. What was I doing at a trashy lingerie shop? I was on my way to the organic vegan restaurant next door, of course. Note that one of the mannequins in this photo is disintegrating. I don’t have any theories on that, or at least any theories I could reveal in a family-oriented blog like this.That’s the best part about LA- you’ll find insane juxtapositions of high and low culture, good taste and bad, or hippie food and pervert mannequin fetish all on the same block (oh, wait, this is starting to sound like my Master’s Thesis). 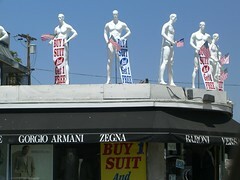 As long as we’re on the subject of weird juxtapositions in Los Angeles, don’t white plaster statues of men with American flags make you want to run out and buy a suit? Even Beverly Hills needs it’s sunscreen, cheap liquor, and soft serve.